November 6, 2015 — Editor’s note: Proper safety and survival training is critically important for dealing with emergencies and disasters at sea. To learn more about maritime safety and to enroll in a maritime safety and emergency preparedness course, contact Fishing Partnership Support Services. 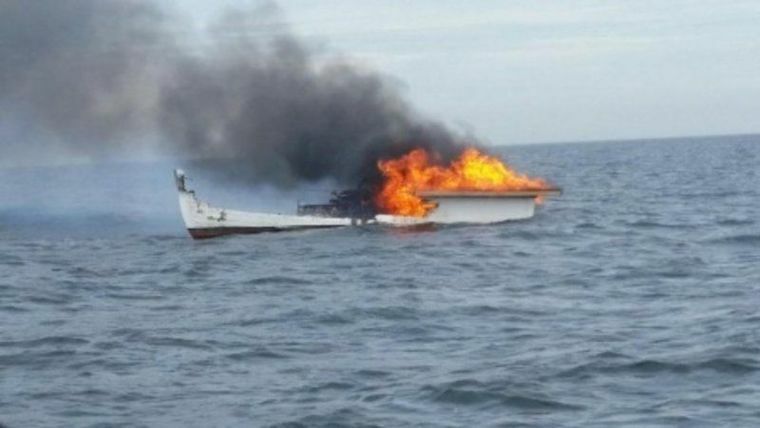 A lobsterman was forced to jump overboard after his vessel caught fire just off Plum Island on Friday morning. Luckily for Sam Allen of the Dawn Breaker, two men in a nearby vessel were able to pull him out of the water within 15 minutes. Though Allen, an Ipswich resident, sustained no injuries, the Dawn Breaker is a total loss. The fire started when the Dawn Breaker’s engine began to overheat. Allen tried to put the flames out with a portable fire extinguisher, but the vessel went up fast, Lt. Lee Prentiss of the Ipswich Fire Department said. The Coast Guard lauded Allen for his quick actions. “This is the mark of a true professional mariner,” said Petty Officer 1st Class Darin Crozier, a watchstander at Coast Guard Sector Boston’s command center, in a statement. “He was prepared and did everything right — he donned his immersion suit, communicated his location clearly with his radio, and abandoned ship with his locator beacon.